Russia, the world's largest country, is a magnetic place and you get used to it quite fast. It becomes a magnet for some who stay back and a habit for others who return periodically to this land. In the 18th century, during the era of Russian Enlightenment, the development of Russian literature was boosted by the works of Mikhail Lomonosov and Denis Fonvizin. By the early 19th century the Golden Age of Russian Poetry, began with Alexander Pushkin, who is considered the founder of the modern Russian literary language and often described as the "Russian Shakespeare". It continued into the 19th century with the poetry of Mikhail Lermontov and Nikolay Nekrasov, dramas of Alexander Ostrovsky and Anton Chekhov, and the prose of Nikolai Gogol and Ivan Turgenev. Leo Tolstoy and Fyodor Dostoyevsky have been described by literary critics as the greatest novelists of all time. Study Russian language in Russia under the Learning in Russia™ program for international students in leading Russian Universities in Archangelsk, Moscow, St.Petersburg and Tomsk! Of course, the most interesting and easiest way to learn Russian language is to do it in Saint Petersburg, Russia. 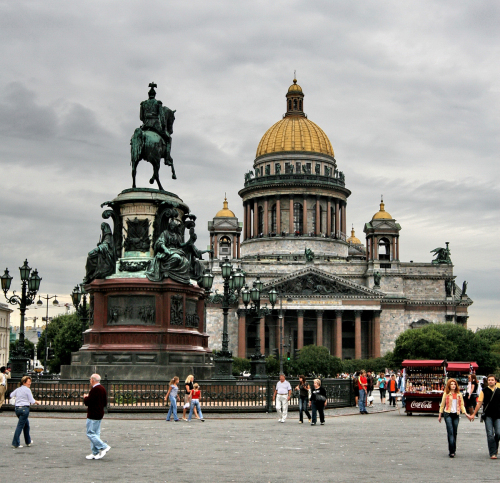 St.Petersburg is the Education and Cultural Capital of Russia. It is also the city of Pushkin, the father of Russian literature! Learn the basics of Russian culture and socio-cultural features of communication. Obtain information about the target language country and Russian system of higher education. Bring down the language barrier in adaptation to learning in a foreign environment. Optional: It can be extended for a year more, making it a two year course. The Universities employ Russian Language professors have vast experience in working with different audiences – from international students, foreign business persons to foreign diplomats. The Russian Language Department offers Russian language courses to full-time international students with any level of proficiency. You don't need to know any Russian for enrolling in the program! The Russian Preparatory courses combine Russian language instructing with extensive training in study skills necessary for university level in Russia. The curriculum includes practice in lecture comprehension, note-taking, test-study procedure, essay and technical writing, text analysis, and library research skills. To enable our students to study Russian language at our Russian language courses in special audio and video materials are widely implemented, and classrooms are equipped with interactive multimedia boards. There are September through November intakes into the program which enables students to qualify for university courses commencing the following year. The Russian language department also arranges cultural events in order to familiarize students with Russian historic and cultural traditions: museums, exhibitions, theatres, national events, and excursions. The Russian preparatory course caters specifically to international students. It assists students in all aspects of living and studying in Russia. Get prepared for studies in Russia with your distinctive Russian accent! Come, study in Russia!